I spent some time drawing the figure on the right, in the sketch below. After a while another man came to the table and sat down. I could tell there was a teacher-student relationship between them. It is difficult to portray time in a still picture. Perhaps the relaxed position of the man on the right as compared to the attentive manner of the other person might convey the idea that the two people arrived at different times. This would only be true if one knew these two figures has some kind of social relationship. I don’t think one could tell from the drawing that the two figures inhabit two different time frames. 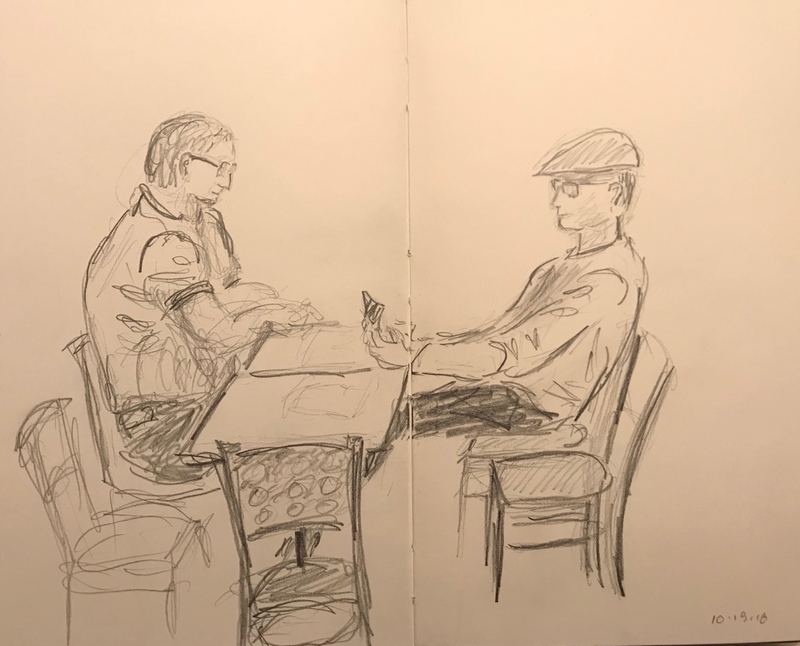 This entry was posted in Personal Stories and tagged art, artistic process, double portrait, drawing, pencil sketch, portrait, portrayal of time, sketch, time, visual art. Bookmark the permalink.